Not to be confused with Porphyria or Porphyriticity. "Pyrophorus" redirects here. For the bioluminescent beetle genus, see Pyrophorus (beetle). A pyrophoric substance (from Greek πυροφόρος, pyrophoros, "fire-bearing") ignites spontaneously in air at or below 55 °C (130 °F). Examples are iron sulfide and many reactive metals including plutonium and uranium, when powdered or thinly sliced. Pyrophoric materials are often water-reactive as well and will ignite when they contact water or humid air. They can be handled safely in atmospheres of argon or (with a few exceptions) nitrogen. Most pyrophoric fires should be extinguished with a Class D fire extinguisher for burning metals. The creation of sparks from metals is based on the pyrophoricity of small metal particles, and pyrophoric alloys are made for this purpose. This has certain uses: the sparking mechanisms in lighters and various toys, using ferrocerium; starting fires without matches, using a firesteel; the flintlock mechanism in firearms; and spark-testing ferrous metals. Small amounts of pyrophoric liquids are often supplied in a glass bottle with a PTFE (Teflon)-lined septum. Larger amounts are supplied in metal tanks similar to gas cylinders, designed so a needle can fit through the valve opening. A syringe, carefully dried and flushed of air with an inert gas, is used to extract the liquid from its container. Pyrophoric solids require the use of a sealed glove box flushed with inert gas. Glove boxes are expensive and require maintenance. Thus, many pyrophoric solids are sold as solutions, or dispersions in mineral oil or lighter hydrocarbon solvents. Mildly pyrophoric solids (such as lithium tetrahydridoaluminate (lithium aluminium hydride) and sodium hydride) can be handled in the air for brief periods of time, but the containers must be flushed with inert gas before storage. White phosphorus, the original "phosphor"
Iron sulfide: often encountered in oil and gas facilities where corrosion products in steel plant equipment can ignite if exposed to air. 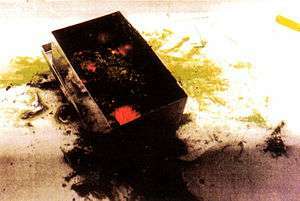 Uranium is pyrophoric, as shown in the disintegration of depleted uranium penetrator rounds into burning dust upon impact with their targets. In finely divided form it is readily ignitable, and uranium scrap from machining operations is subject to spontaneous ignition. The GBU-39 is an example of a "bunker buster" bomb where uranium is mentioned in the patent as a way to achieve an "incendiary effect" with "pyrophoricity". Plutonium: several compounds are pyrophoric, and it causes some of the most serious fires occurring in United States Department of Energy facilities. Hydrazine is hypergolic with oxidants like dinitrogen tetroxide, but not truly pyrophoric. ↑ DOE | Office of Health, Safety and Security | Nuclear Safety and Environment | Uranium, retrieved 3 September 2013; archived on 24 August 2010. ↑ "the shot may include an incendiary material such as a pyrophoric material (e.g. zirconium [...] copper, depleted uranium) http://www.google.com/patents/US20070157843 "
↑ DOE | Office of Health, Safety and Security | Nuclear Safety and Environment | Plutonium, retrieved 3 September 2013; archived on 28 September 2010. "List of pyrophoric materials". Archived from the original on 2015.